I had a job where the PCs were locked down such that only approved applications and web sites are allowed. The company maintains a web page of reference documents. Let’s call it “Genius”. The Genius page is laid out as a frame based document with a navigation frame on the left and the target (main) frame to the right. It’s fairly workable, if you just want to casually browse the Genius content. But the users are telephone customer service reps, and they need to quickly navigate the content, often with multiple instances of Genius running, each showing a different topic. The problem was, the main Genius page did not use the HTML title attribute. Why was this a problem? Because Windows would show an identical taskbar icon for each one, all showing “https://genius.myincrediblesite.com/wtf….” Not very descriptive, and not easy to select the desired icon when looking for the “Account number format” screen, for instance. It occurred to me that using the title attribute would make navigation easier, and I submitted a suggestion to use it. But I realized it wouldn’t be easy because of the framed nature of Genius. What good would it be if every instance of Genius displayed it’s Hover hint as “Genius”? Distinct sub-titles for each frame would be more useful. So, in my suggestion, I noted that “this may or may not work with frames”. 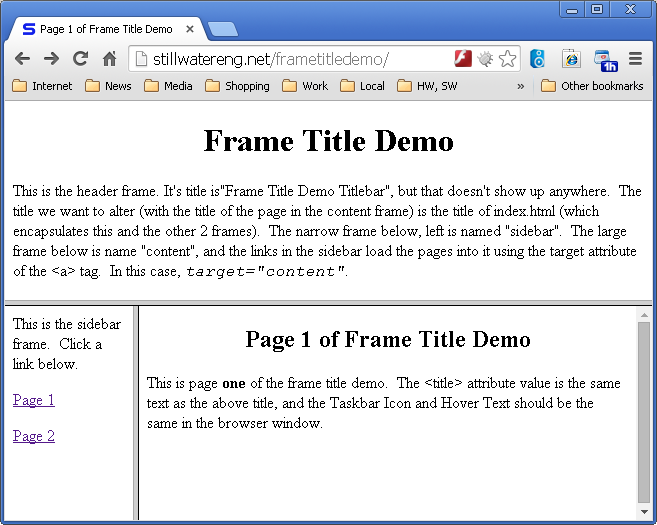 Opening two instances of a browser at this page yields taskbar icons with titles set according to frame content. 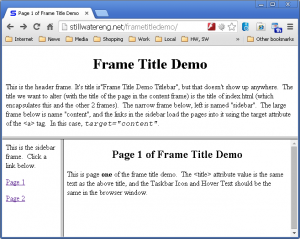 Two instances of Internet Explorer displaying different frames but on the same page. I don’t know if they tried it yet. I’ll let you know if I find out.